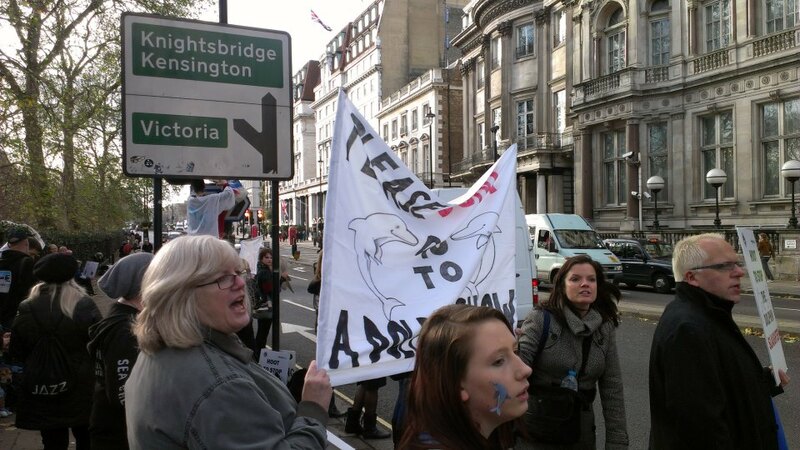 I went to the Protest against the hunting/killing/capture of dolphins yesterday in London. There was a great turnout and we all brought our loud voices with us. I didn’t even need a megaphone. Probably due to my promise to shout on behalf of a group of friends who could not attend. I think that I managed to channel a cacophony of all of our vocal chords. People had made some brilliant banners, someone bought whistles and there were leaflets for passers by. We were offering these to people who came along. Some declined to take them but others were interested. Some people also stopped to sign the petition. Drivers of cars, London’s black cabs, buses and lorries honked their horns to add to the melody of the rally as they went past. Some of the chants that we used were “Taiji Lies while Dolphins Die”, “No Capture No Slaughter”, “Stop Killing Dolphins”. We were also educating people about dolphin shows. I know there is a misconception that the dolphins are born into captivity so that they do not know any other lifestyle. This is not so. They are hunted, captured, wrenched from their family (pod), and put in a pen to be trained to do tricks for dead fish. Bear in mind also that they have witnessed their family being slaughtered. Dolphins are sentient beings who have social awareness so imagine what that is like. We would be getting close to a dolphin’s sense of loss and grief if we imagine it happening to us. We did manage to get our point accross and the Embassy staff definitely knew that we were there. Security was outside keeping a watchful eye on us all day but they did not have to act as we kept within our boundaries. Feelings run very high about this cause but we want to be able to continue protesting or we would let the dolphins down. It was a diverse gathering which illustrates how this cause is touching the hearts and minds of so many people. One girl had negotiated a couple of hours off from work as her boss realised how important the protest was to her. People had travelled from Ireland and accross Britain to be there. I was talking to one lady who said that she had never protested against anything in her life but she had seen a picture of the hunt and slaughter in Taiji and had felt so horrified and moved that she finds that defending the dolphins/whales has become a big part of her life. As someone else said to me, people tend to assume that those who attend these rallies are just militant lefties who like to make noise. But that is not so. It became obvious that a lot of the general public think that this hunting stopped years ago after the film “The Cove” was aired and they do not realise how relentless it is and that it goes on daily (apart from most Saturdays which is the fishermens’ day off) If you get involved in this cause it becomes part of your everyday routine. You check the Sea Shepherds or Save Japan’s Dolphin’s website like other people check the weather report or consult their horoscope. One of the highlights of the day for me was when a Japanese speaking lady used the megaphone to voice our protest in the language of the Embassy. Just to make sure that they understood why all of these people had turned up outside their workplace. There was a girl dressed as a cute dolphin. There was a period when we were standing right opposite the Embassy on the pavement in the middle of the road. A police car came hurtling along at full speed, obviously on a shout and they spotted the dolphin and they were creased up laughing as they zoomed past. Plus one of the protestors managed to position himself outside of the Embassy waving his Sea Shepherd flag. The overriding highlight, is as always at these events, meeting other individuals who care enough to come along and be a voice for those who cannot protest for themselves. There are numerous rallies taking place today. People will be in the vicinity of the London Embassy again today to hand out leaflets and to further educate the public about the continuing hunts in Taiji. My thoughts are with the courageous people who are rallying for the cause in Tokyo. They are aware that a pro-whaling nationalist group are going to stage a counter protest close to them. The latter will probably be very loud and try to provoke the Anti Hunt Rally. But they know that they are not alone. They have the support of the various groups, protestors and organisations that have been campaigning and speaking out. For the past two days the Taiji Cove hunters have gone out and returned emptyhanded so the Cove has remained blue, our favourite colour. When that happens, we do not get the blues, we rejoice. When we see red, we get upset and angry and more determined. We will not be silenced until the barbaric hunting stops permanently and the Cove remains blue, which is its natural state. Unfortunately, I couldn’t make it to London 😦 but, I am doing everything I can online. IS THERE ANY NEWS ON FEB 2013 RALLY ? Hi there ! I am not organising it and like you, I am waiting for confirmation. Pencil in Friday 22nd February. Apparently it will be confirmed in the next couple of days.